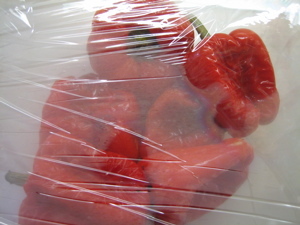 How to roast a pepper, is a lot simpler than one might imagine. Whenever a recipe calls for something to be skinned, my initial reaction is EEK! That will require a lot more work, but that is not always necessarily true. There are so many fun recipes that work with roasted peppers or just adding them to any sandwich or salad. So here is how I roast my peppers. 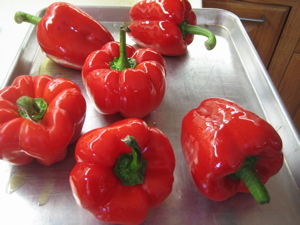 Brush each pepper with a little olive oil, place on a baking sheet and bake in oven at 400 degrees for about 30 minutes. Remove from the oven and either place them in a brown paper bag or in a bowl covered with plastic wrap. Let them cool, it is much easier to handle when they have cooled down (at least ten minutes). The skins will just peel right off and remove the center seeds. Now they are ready to do what you please with! They will keep for about 1 week. Definitely a great color to use for next week on the 4th of July! My mom always says to run the peppers under cold water after roasting them and before trying to peel the skins off…comments?